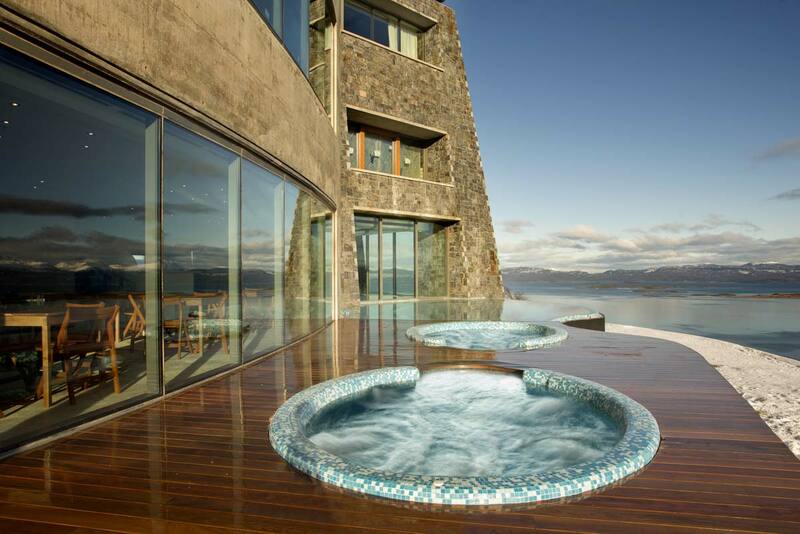 The luxurious Arakur Ushuaia hotel is located within the Cerro Alarkén Nature Reserve in Tierra del Fuego, the southernmost province of the Argentine Patagonia. 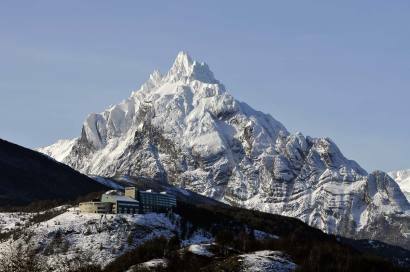 Arakur Ushuaia is a member of The Leading Hotels of the World and it is the only resort in the Southern Patagonia to have become part of this exclusive group of hotels. Close to Mount Alarken’s summit and located on a natural balcony 800 feet above sea level, the luxurious hotel is found in all its splendor, amidst a 100 hectares of native forests of lengas, ñires and coihues, which are home to diverse species of fauna and flora, offering the perfect balance between calmness and adventure. Offering privileged views of the city of Ushuaia and of the Beagle Channel, Arakur Ushuaia is located just 10 minutes from the city and the port of Ushuaia and 20 minutes from the international airport and the Cerro Castor Ski Resort. Arakur Ushuaia was created to enjoy its facilities,respecting and deeply caring for the environment . 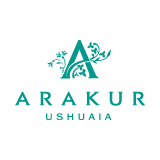 With a standards-based sustainable architectural design Arakur Resort & Spa extends along a spectacular natural balcony situated 800 feet above sea level, surrounded by stunning panoramic views, native forests, natural terraces and green areas harmoniously integrated. The magnificent Lobby welcomes the guests with its large windows, the warmth of their fireplaces and native decor. Placed in a privileged location, Arakur Ushuaia is located within Cerro Alarkén Natural Reserve. At the Southernmost point of the world, set in the mythical Tierra del Fuego and washed by the waters of the Beagle Channel, stands the the city of Ushuaia. A destination to visit, enjoy, and explore. 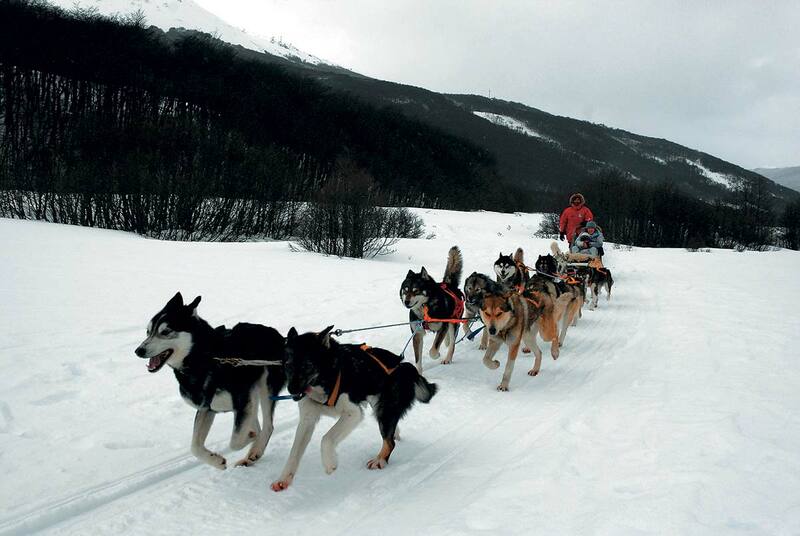 • Skiing and winter sports. • Tierra del Fuego National Park with wildlife watching. • Museums and Cultural Centers. • “End of the World” train. • Climbing, winter sports, etc. Children are provided with a kids’ club and pool areas. 66 Double rooms, 4 Senior Suites, 3 Master Suites and 1 Imperial Suite with panoramic view to the South, the Bay, the Beagle Channel and the City of Ushuaia. 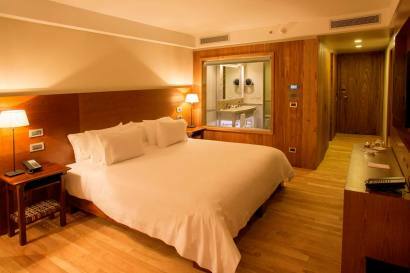 All of them are elegantly decorated double rooms with contemporary design and equipped with the latest comfort technology and with panoramic view. 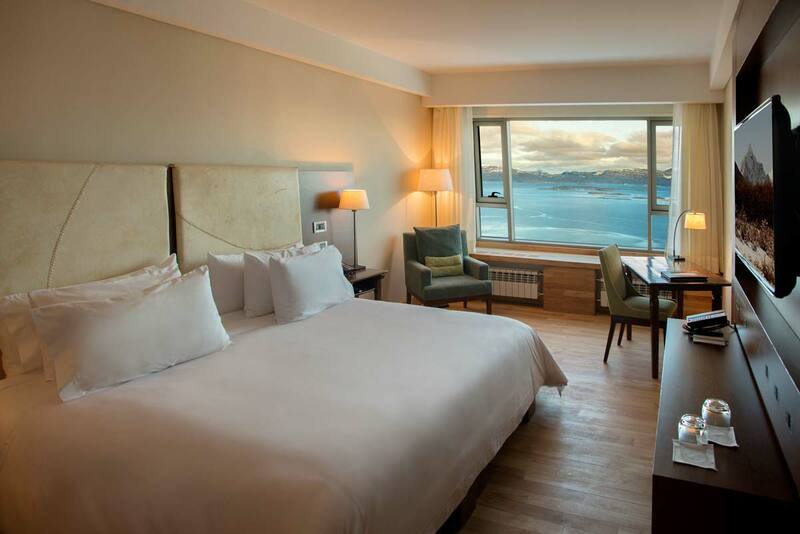 20 twin deluxe rooms with panoramic views to the Beagle Channel and Ushuaia Bay, with two 1.40 metre double beds to enjoy with family or friends. Two double beds allow guests to use these rooms as extra comfortable twin beds, the same as in the family plan. 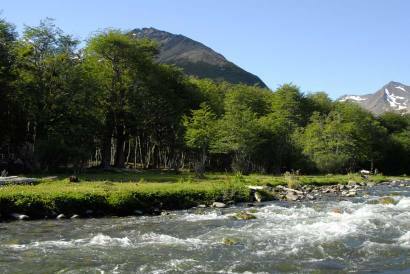 Triple rooms with panoramic views towards the North, the Andorra Valley, the mountains and Reserva Natural Cerro Alarkén. They can set up as Triple Twin or King + Twin. Senior Suites have two comfortable rooms which include a living room and bedroom. The sophisticated and native elegance combines with the leading-edge comfort technology, with a Samsung LED TV 40”, a home automation system with led-lighting, etc. 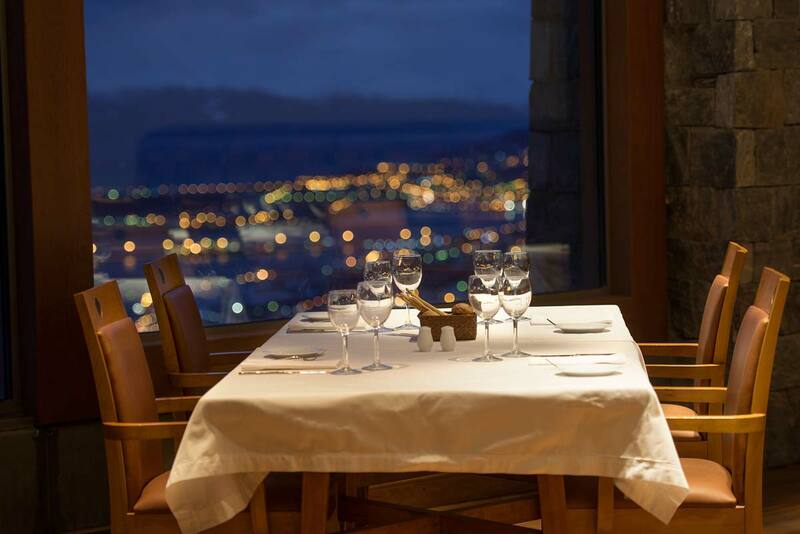 Typical flavors from Tierra del Fuego can be enjoyed in La Cravia restaurant: Argentine and international meals to be ordered either from the menu or served at the buffet (sitting 150 people). Argentine barbecue, spider crab, lamb and Patagonian seabass are some of choices to enjoy together with incredible views from the city and the bay. A wide range of drinks, local hand-brewed beers and Argentine wines together with cheese and Patagonian cold cuts platters await in order to enjoy a unique sunset over the bay to the soft melody of the Steinway average tail piano. A sophisticated wine list to taste with a selection of cold cuts and cheese. For calm and relaxation, the hotel offers a pool area with 200 m2 (2152.8 ft²) water mirror pools, a 17-meters lap swimming pool, an edge infinity in-out relax pool with underwater music, which, in the indoor section, offers two hydrojets areas and a kids’ pool as well as two hot tubs for up to ten people in the outdoor deck with panoramic city and sea views. 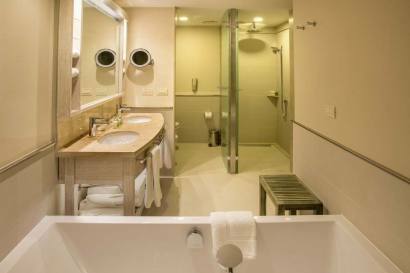 The area has a solarium, radiant floor heated changing rooms, a pool bar, massage and hairdressing services. 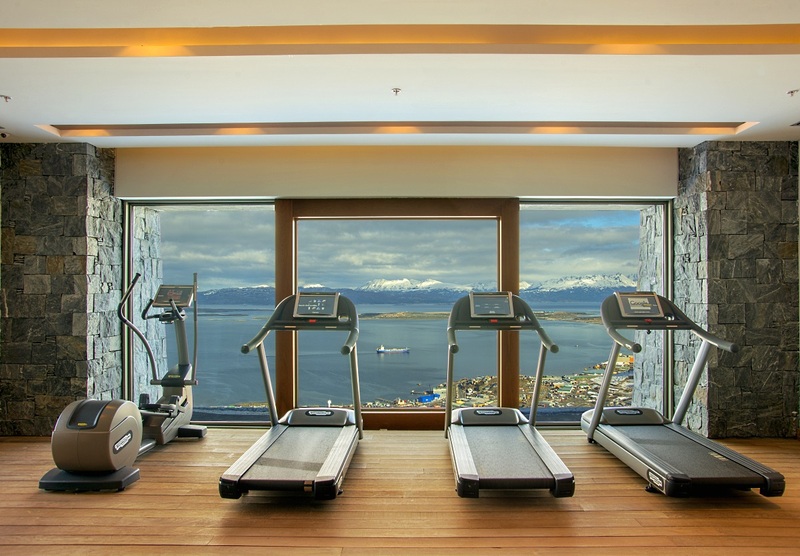 For a healthy and complete training routine, the fitness area offers Technohym technology and an 80 m2 sector of treadmills, elliptical trainers, stationary bicycles, Kinesis, weight benches and dumbbells; all of these with a panoramic bay view. Both for social and corporate events, Arakur Ushuaia is a different and distinguished option to honor the guests, offering facilities for event of all types and sizes. 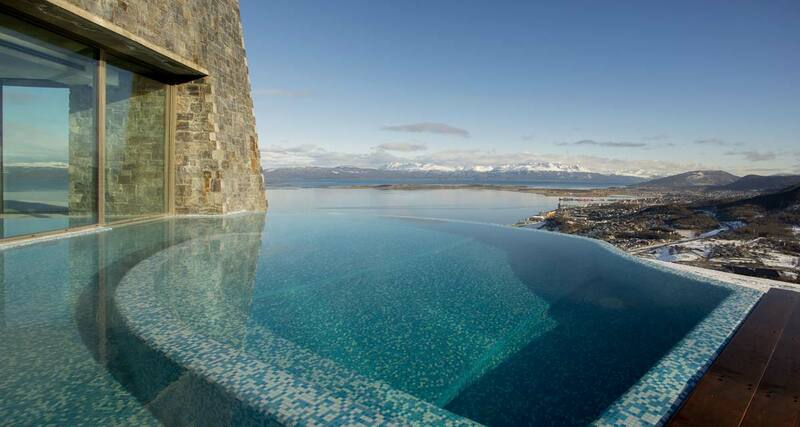 Arakur Ushuaia offers a 1300m2 (14,000 sq. ft.) special venue for events and conventions with separate access. The Magallanes Room is located on the ground floor and has been designed and equipped for all kinds of events. It includes a private foyer, which becomes perfect for receptions. 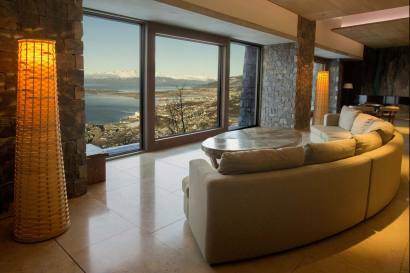 The ballroom has large windows overlooking Ushuaia Bay and the Beagle Channel. Additionally, there are 3 meeting rooms on the second floor which can be opened up into a larger and wider room offering an impressive valley view. With more than 100 hectares (247 acres) of a natural reserve of native forests, flora and fauna and more than 1 km (0.62 miles) of river bank along Arroyo Grande, Arakur Ushuaia was thought for those who enjoy life outdoors all the year round and in any season, offering multiple alternatives to experience nature intensely. 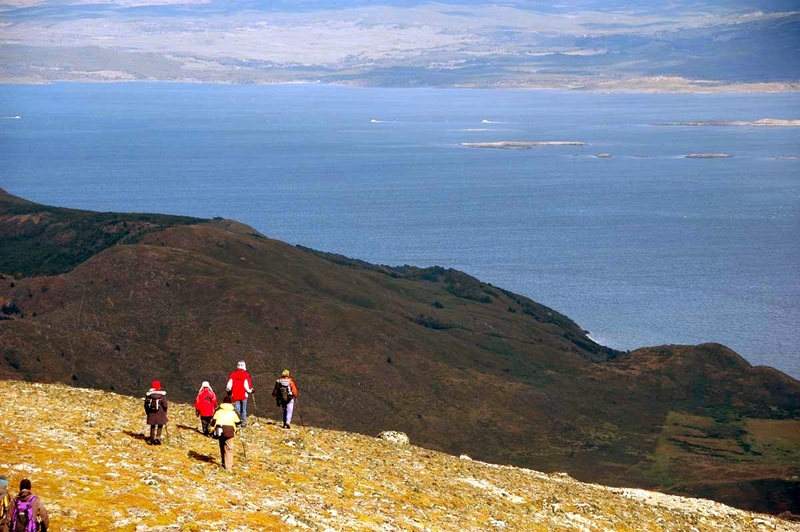 The hiking trails that go through the Cerro Alarkén Nature Reserve begin at its gates and guests can go hiking, at different levels, through the native forests, the peat field, the Cerro Alarken’s summit and the Arroyo Grande, among others. The natural scenic overlook that is located at the top of the Cerro Alarkén offers stunning panoramic views.